The eGo EVOD metal clearomizer, paired with the eGo 650 LCD batteries is the way to go if you’re looking for superior vaping and hours of battery life. The EVOD metal is a bottom-feeding clearomizer with replaceable heads/coils/wicks. This saves you money and allows for quick and easy filling and maintenance. The 650 LCD batteries, when charged for the proper amount of time (3hrs), will give you approx. 5-7 hours of vaping time between charges. It also has an LCD screen that tells you the life of the battery and also the amount of puffs you’ve taken. This eGo EVOD Blister Pack has all of the components needed to give you the vaping experience you’re looking for; One EVOD clearomizer, one eGo battery with LCD and a USB charger. All you need to begin you’re vaping journey is a bottle of our e-liquid and you’ll be good to go. 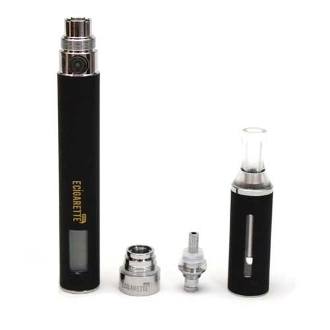 The replaceable coil screws into the bottom cap of the eVod clearomizer. Simply unscrew the bottom cap and replace with a new head without the need to empty your remaining liquid from the tank. Turn the clearomizer upside down, and remove the bottom thread assembly. Tilt the EVOD at a slight angle; fill with 2.4ml of your favorite e-liquid. **Do not allow liquid to flow in to the center air hole tube **Be sure to check and tighten the Bottom coil, after filling with liquid. This will ensure that no leaking will occur. See our E-Liquid section; featuring 85 yummy flavors! Can't decide which ones to try? Take advantage of the Buy 4, Get 1 Free special. Mix and match a variety of fantastic flavors for an affordable price. We have five varying nicotine levels available.